The Importance of Family History Narrative | Do you know your history? I came across this article today in the New York Times, and I want to share with you all directly. It’s not often that we think of the importance of our Family Heritage, and how those stories impact on our younger generations. The article made me think about my own childhood, and the family stories I collected. I realised that these stories, although not all directly related to me – with exception of my birth story, that my Dad used to call me up and tell me in detail every year on my birthday) – yet these stories helped me to form an idea of who we were, and what I could become. They gave me strength when I thought I wasn’t capable. I’m grateful to be able to help people get back in touch with their Family Origins and Meaning of their Name. Whether we realise it or not, every name has a meaning and purpose. Every name has a unique sound, that carries with it a kind of energy. We hold this energy throughout our life. Some people fight it, some embrace it. Some spend years looking for it, only to realise they had it all along. Do you know your Family Name Origin and Meaning? What about your Family Motto? 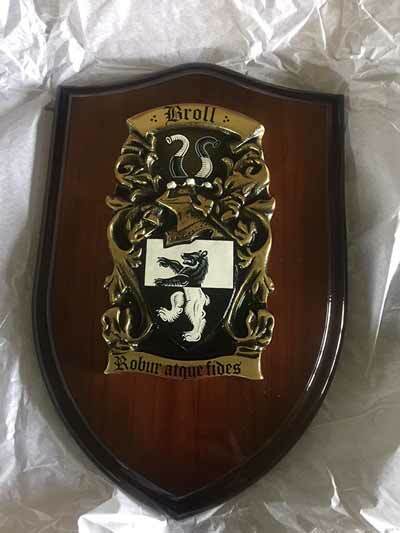 Or the Family Crest and Coat of Arms? Having been involved with Heraldic Names now for 10 years, working alongside my Dad who has since passed away, I have come to realise that your name and your heraldic symbols have far more relevance to who YOU are today than any other external or material item you identify with. Your Motto (if you have one, not everyone has one) often floors people, as once they learn what it is, the resonance with their struggles and their philosophical outlook on life is suddenly summarised and captured – something they didn’t realise they had all along. Specialists in Family Name and Heraldic History. 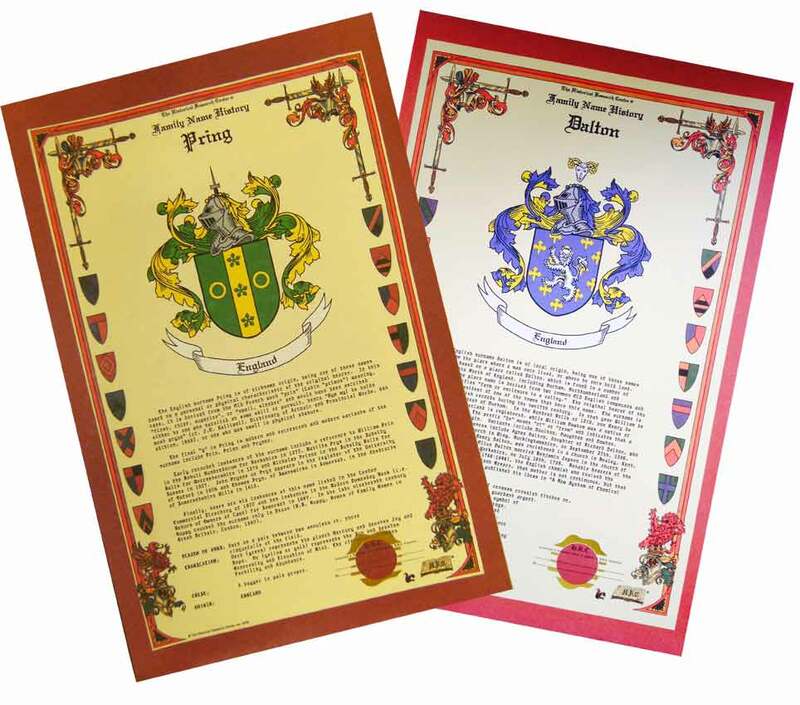 The Celebration scroll combines both Family Name History and Coat of Arms onto the one large Heavy weight certificate, complete with Gold Seal. Get 2 for 1 on the same name, or Second name Half Price on different names. Great for Gifts. Our Artisan crafted handmade shields are handcast and handpainted. The Medium Brass Shield is shown here, with exceptional attention to detail – 340mm high x 225mm wide. This is the one we most likely recommend due to its presentability on the wall. The size allows for details to be seen easily. 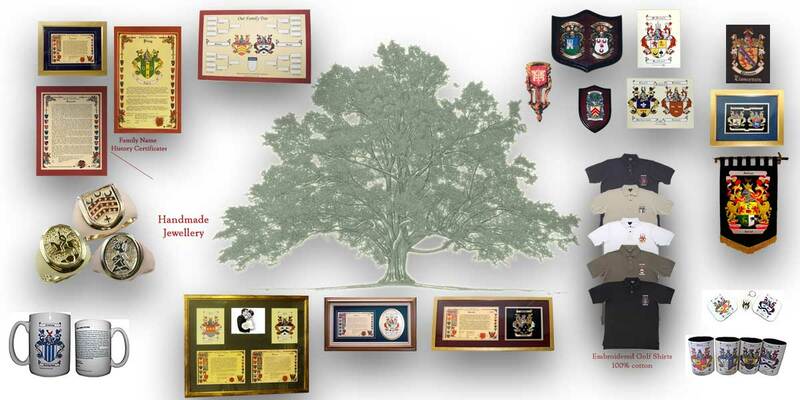 All shields come with a complimentary Name History Certificate ready for framing. Our handstitched embroideries incorporate a full colour pallet and Gold and Silver bullion threads and wire. 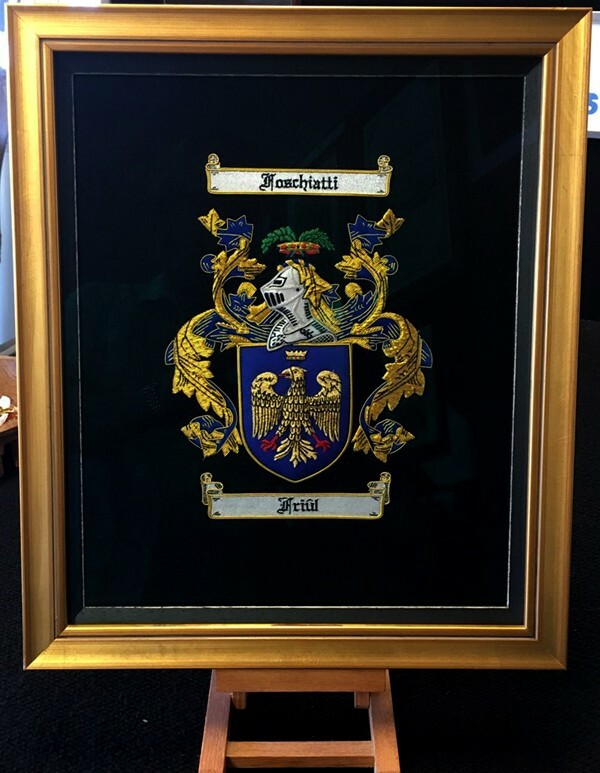 Not much compares to the impact of a Heraldic Embroidery. All embroideries come with a complimentary Name History Certificate, ready for framing. 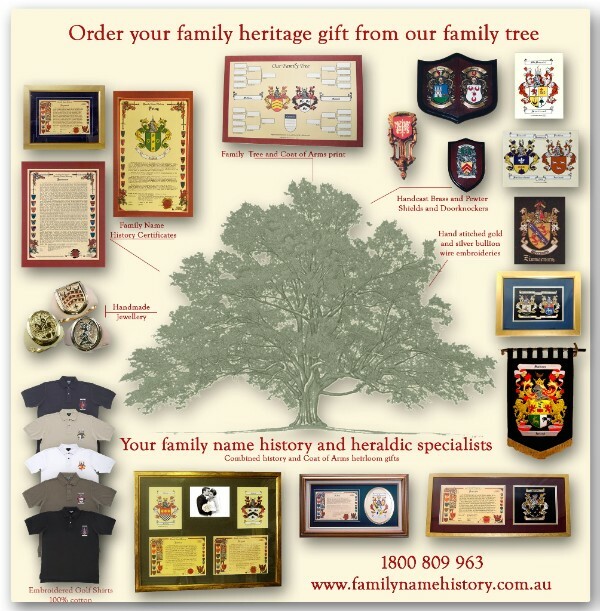 You’ll find a Family Heritage Gift for Everyone in our Extensive range.